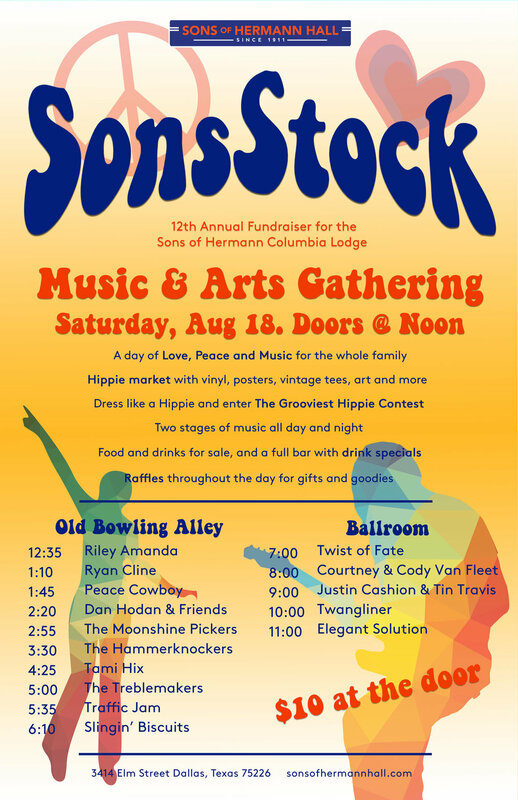 SonsStock is an entertaining, family-friendly event where musicians and artisans join efforts to raise funds for Sons of Hermann Lodge 66. In addition to its fundraising efforts, it is also a celebration of Woodstock which coincides with the anniversary weekend 49 years ago. And this year we celebrate the fiftieth anniversary of the Summer of Love as well! The hall is filled with Love, Peace and Music, as well as vendors selling their wares throughout the day. Items of interest to be sold in our “Hippie Market” are rare vinyl records, rare posters, vintage band concert t-shirts (covering bands from the 60’s to present day), as well as, tie-dye goods, vintage clothing, woodwork, pottery, paintings, prints, jewelry and much, much more. Everyone who attends is encouraged to dress up like a Hippie and enter the Grooviest Hippie Costume Contest. A raffle will be held throughout the day to win various gifts and goodies and food will be sold on the premises. The bar always offers sodas for the kids, drink specials and a large selection of cold beer. Music performances around our Electric Campfires will be happening all day long. Acts will be supported by a full sound system as they play around the Electric Campfires.